Erin Mahony, 21, of Whiting graduates this May with a bachelor’s degree in biology and minors in psychology, chemistry and mathematics. A top student, with an impressive 3.95 grade point average, the future doctor is proud to announce she’ll be attending IU School of Medicine – Northwest this fall – a dream she’s had since before the day she ever set foot at IU Northwest. While a senior at Whiting High School, Mahony attended an IU Northwest event in which prospective students could explore going from a “Freshman to Physician,” as the event was so aptly named. So when Mahony enrolled at IU Northwest after high school, she knew a biology degree would prepare her well for the intensity of medical school. But she didn’t stop there. She knew that her preparation for becoming a doctor would involve taking advantage of every opportunity. Those activities included: president of the Pre-Professional Studies Club; senior representative of the Student Government Association; member of the Student Alumni Association; a leader for the New Student Orientation; and a participant in the IUSM-NW Summer Research Internship Program and International Human Cadaver Prosection Program. She did so with honors, receiving awards from the Tri-Beta Biology Honors Society, the Pre-Professional Studies Club, the International Human Cadaver Prosection Program, and was named an outstanding student in both biochemistry and biology. 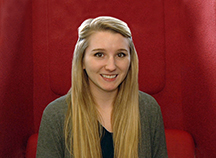 Mahony says that earning scholarships to attend IU Northwest played a role in her success. About the Class of 2018: Indiana University Northwest will confer 777 degrees at the 52nd Annual Commencement ceremonies on May 10, 2018. The Class of 2018 will collectively receive 49 associate’s degrees, 638 bachelor’s degrees and 90 master’s degrees. The oldest student graduating is 62 years old and the youngest is 19. More than 70 percent of the graduating class is female.